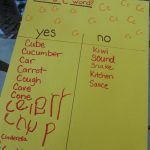 Playing with letter sounds is so much fun, we are always finding new ways to add in a little practice. In fact tonight after our story I asked M and M to give me a word that started with the letter M before they were carried off to bed. They answered so quickly, I decided to make it a little more challenging. “Can you think of a word that ends with the letter M?” That was a bit too difficult, but it did get Daddy in on the game. Have your little one stop after each step and ask the question. “A makes an “A” sound. Can you think of a word that starts with “A”? Make sure they guess before they move on. If their answer is less than right, give a “Great try; octopus actually starts with O “O”.” Then let them move ahead. 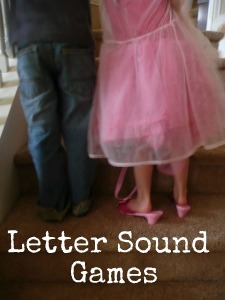 What letter sound games do you play?